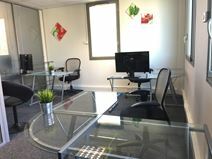 Located in Montbonnot-Saint-Martin, this premium office space provides a range of office solutions including private offices, shared co-working spaces and virtual office options. Access to meeting rooms is easily booked and you can use shared communal spaces such as a beautiful outdoor patio and roof terrace. The building is only a two minute walk from the bus stop and around the corner from the light rail station, which connects you to the rest of the city and wider areas. The neighbourhood offers a great choice of trendy eateries, supermarkets and hotels. With views of the Alps this business centre provides serviced office space, private meeting rooms and a business lounge. Tenants benefit from its strategic location on the Grenoble ring road and the innovation that comes from the nearby university. In addition, these open-plan, furnished offices come with IT support to ensure you stay well connected, and that your business operates as efficiently as possible throughout your working day. Ideally located just across from the train station in the heart of Grenoble this traditional building blends the character and charm of history with modern high-tech facilities. The city itself is popular with traditional businesses and companies from consulting and IT. Here, you can benefit from the centre's 24 hour access and security. There is also parking for you and your clients, giving you peace of mind for your commutes. Far enough from the city centre to be surrounded by beautiful greenery and stunning mountain vies, but close enough to pop into the city for a meeting, this dramatic office space even has an open air meeting room for the summer. The interior creates a motivating atmosphere that enhances focus, productivity and efficiency. The services at this attractive centre include 24 hour access, central heating and shared internet with IT-support on-site to keep you well connected. This smart centre is inside a converted factory building which lends period character to modern facilities. It has a charming atmosphere that will enhance your motivation and productivity. The offices are offered fully serviced or with the option of a Virtual Office package. Near to the centre of Grenoble, the property is an easy distance from Geneva airport and has good public transport access by motorway and tram. These turnkey solutions are the perfect location for companies that value accessibility and practicality.10 private office suites closed off with glass partitions provide a private yet bright working environment to enhance your productivity and focus. Along with 24 hour access, there is also a secure mail and parcel box where you post is kept securely until you collect it. Also just five-minutes on foot from the centre you will find the Shopping Mall which houses many cafes, bars and restaurants. Opening soon in October 2018 this brand new business centre located in Sud Galaxie business park benefits from a prime location and offers contemporary and modern office solutions. Work spaces come fully equipped and ready to use, along with 5 large meeting rooms that can accommodate up to 30 people - making the centre ideal for large project teams. High speed fibre optic wifi will keep you connected and there are phone booths for your convenience. You can relax in one of many communal areas which include the kitchen, lounge or outdoor terrace. The main train station is within walking distance connecting you to the rest of the city, and the local area offers plenty of bars, cafes and restaurants. This sophisticated building is located on a large-scale business park in the heart of the Centr'Alp zone. Just north of the city, the business centre allows tenants to avoid the hustle of the city centre while still remaining close to the high-tech firms that reside there. With IT support on-site, this centre is well equipped to help ensure your business stays well connected and running as efficiently as possible at all times.